If you are reading this page, you more than likely have received your J-Seals and Unnatural Implants Removal, your 12 Strand DNA Activation sessions and also your Golden DNA Activation sessions. Before proceeding please make sure you have received these sessions or your results will not be as strong. Just receiving the 12 Strand DNA & Golden DNA Activation sessions multiple times is not enough. There are many energetic blockages that stop us from embodying our higher self, achieving DNA Activation and preparing for ascension through the activation of our 12 Strand Diamond Sun DNA Template. The purpose of these packages is to dramatically increase your vibrational frequency and consciousness levels. The more DNA activations you receive the faster your spiritually evolve. So if you have not received at the very least your J-Seals and Unnatural Implants Removal session yet, please click this [ link ] first. It is important to note that what we are doing here in these packages is furthering your current development for your own spiritual evolution. The 12 Strand DNA & Golden DNA Activations are extremely powerful, as you are aware and enable you to activate your 12 Strand Diamond Sun DNA Template and all of the golden strands that are found within your activated 12 Strand Diamond Sun DNA Template. 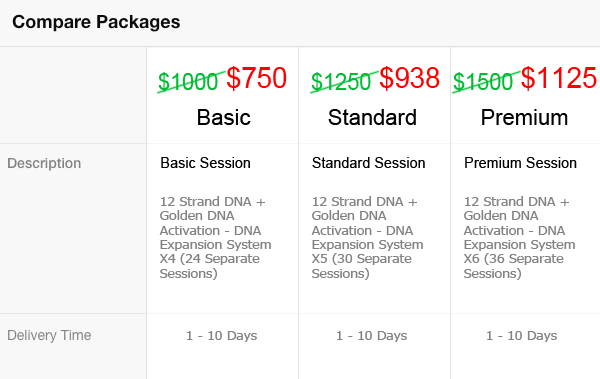 Please know that in order to get the pricing below, you must have already received your J-Seals and Unnatural Implants, 12 Strand DNA Activation and Golden DNA Activation sessions from me. The pricing below is special pricing for existing clients. Your payment will be refunded to if you are not an existing client with the above requirements.